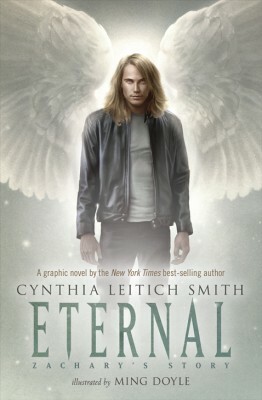 ETERNAL: ZACHARY’S STORY by Cynthia Leitich Smith, illustrated by Ming Doyle (Candlewick, 2013). Cynthia Leitich Smith’s New York Times bestseller is reimagined as a graphic novel seen through the eyes of Zachary, teenage guardian angel. Reckless guardian angel Zachary has an unusual assignment. He’s meant to save the soul of Miranda, high-school theater wannabe turned glamorous royal vampire. Completely devoted to Miranda, Zachary takes his demotion to human form in stride, taking a job as the princess’s personal assistant. Of course, this means he has to balance his soul-saving efforts with planning the Master’s fast-approaching Deathday gala. Vivid illustrations by Ming Doyle elevate this darkly funny love story to a new dramatic level with bold black-and-white panels. More on this title from Cynsations. Ages 12-up. Compiled from promotional materials. MANGAMAN by Barry Lyga, illustrated by Colleen Doran (Houghton Mifflin, 2011). Teenager Ryoko Kiyama has entered our world through a mysterious rift, and it seems that he’s trapped here. But the redoubtable Dr. Capeletti is working on a Machine to return Ryoko to his world. In the meantime, it’s decided that rather than cooling his heels in a government compound, he should get out and experience life as a normal high-school student. The problem? He’s from a Manga universe… A fun story and a clever and sophisticated “meta” treatment of both American and Japanese-style comics. Ages 14-up. Recommendation by Greg Leitich Smith. 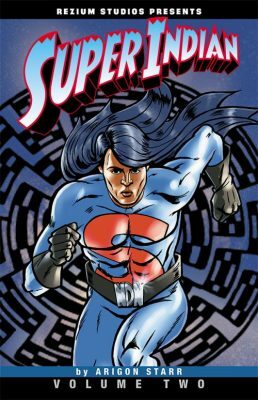 SUPER INDIAN by Arigon Starr (Wacky Productions Unlimited, 2012). Hubert Logan was an ordinary Reservation boy until he ate tainted commodity cheese infused with Rezium, a secret government food enrichment additive. Known as Super Indian, Hubert fights evil forces who would overtake the Reservation’s resources and population. Assisted by his trusty sidekicks Mega Bear and Diogi, they fight crime the way they know how—with strength, smarts and humor. More on this title from Cynsations. Ages 12-up. Compiled from promotional materials. Look for more books in the series. TANTALIZE: KIEREN’S STORY by Cynthia Leitich Smith, illustrated by Ming Doyle (Candlewick, 2011). As a hybrid werewolf, Kieren is destined to join an urban Wolf pack and learn to master his shift. Soon, he’ll leave everything behind: home, school, his family, and Quincie, his human best friend . . . who’s beginning to be a whole lot more than a friend. For years, Kieren has managed to keep his desires– and his wolf– at bay. But when the chef at Quincie’ s family restaurant is brutally murdered, Kieren resolves to be there for her, even if it means being framed. Even if it means watching Quincie’s beloved restaurant morph into a vampire lair. But when the new chef begins wooing her, how long can Kieren control his claws? How long can he protect Quincie– and himself? In an elegant graphic edition featuring cinematic sequential art by debut artist Ming Doyle and lush, romantic cover art by Sam Weber, bestselling author Cynthia Leitich Smith re-envisions her delicious dark fantasy through wolfish eyes. Young Adult. More on this title from Cynsations. Ages 12-up. Compiled from promotional materials. ZAHRA’S PARADISE by Amir, illustrated by Khalil (First Second, 2011). This powerful graphic novel tells the story of the search for Mehdi, a nineteen year old caught up in the aftermath of Iran’s Green Revolution of 2009. 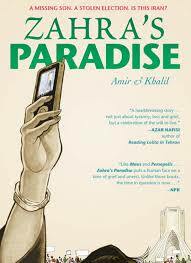 Last seen at the Freedom Square, his mother and his brother, a blogger, now search for him, trying to negotiate their way through the cruelty and fecklessness of the state bureaucracy… In addition to being a fine story, well-told and richly drawn, ZAHRA’S PARADISE does an excellent job of cutting through the headlines, bringing characters to life, and illuminating Iran’s recent history. Ages 14-up. Recommendation by Greg Leitich Smith. Comics in the Classroom: 100 Tips, Tools and Resources for Teachers by Kelsey Allen from Teaching Degree. Note: many annotated links. GETTING GRAPHIC! COMICS FOR KIDS by Michele Gorman (Linworth, 2007). SEE ALSO GETTING GRAPHIC! USING GRAPHIC NOVELS TO PROMOTE LITERACY WITH PRETEENS AND TEENS by Michele Gorman (Linworth, 2003).